Revolutionizing the way medical professionals treat patients, medical equipment carts provide necessary aid during treatment improving a medical facilities response rate and efficiency. Depending on the needs of a healthcare facility, there are different medical carts available to fit every facilities’ needs. On average carts are lightweight, customizable, stable, and easy to use. One of the most vital components of treating patients, ease of access to medication is necessary for healthcare facilities. A medication medical rolling cart has an increased number of storage spaces compared to other carts. Safety features, such as self-locking drawers, keep medication safe so the practitioner can focus solely on patients. Medication carts with monitors are available for accessing patient information on-site and recording which medications where administered. Hospitals need to have rapid response times during emergencies. 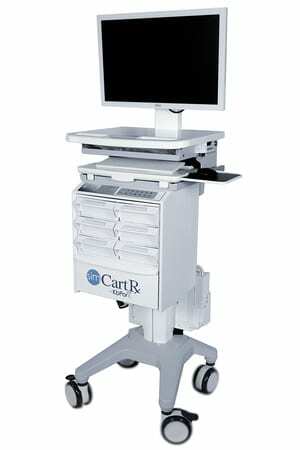 Medical facilities primarily use code carts, also known as crash carts, for this purpose. Code carts come in different shapes and sizes to fit every facility. They also have multiple peripheral options a medical professional can choose from depending on what the facility needs. Organized to contain medical supplies like sanitary supplies, medication, and a variety of equipment code carts allow a medical professional to have all the necessary supplies on hand. Normally code carts store medication in the upper half, intubation supplies in the middle, and sterile kits on the bottom. A medical metal rolling cart, bedside carts have the primary use of treating patients during the recovery process. When checking in on a recovering patient, a nurse or doctor will bring a bedside cart with them in case additional treatment is necessary. Bedside carts can stay with the patient after the medical professional leaves the room and have locking drawers to keep medical supplies safe. The benefit of medical metal rolling carts is that they can endure the consistent cleaning necessary post-treatment while still being lightweight and easy to maneuver. POC, or point of care, carts are used during the process of administering medical tests. During diagnostic testing, a medical professional can electronically log in information using the monitor and pull out keyboard stored on top of a POC Cart. Access to an electronic database on a POC cart improves hospital data organization and additionally reduces the risk of error in a medical facility. The storage components contain medical test materials and safe spaces for transporting tests to labs. Storing tools for administering anesthesia on a medical rolling cart decreases the need for transporting patients from room to room. Anesthesiologists must keep their supplies organized and safe. Medical anesthesia carts have locking drawers to keep potentially lethal medication safe and organized. An anesthesiologist can easily transport supplies thanks to special wheels designed for easy maneuverability through tight or difficult hallways. IVs typically require the use of heavier materials. IV carts designed to hold large quantities of weight while still being easy to transport, make administering an IV easy. They have a special drawer system, which allows for quick bag removal from the front and insertion of bags in the back. Treatment carts have specialized compartments for hazardous waste removal ensuring safe transportation without contaminating additional areas of the hospital. This kind of medical rolling cart has the ability of customization to contain either an opening or locking doors at the bottom. Additional tubs in the drawers are for enhanced organization and ease of access when searching for supplies. Treatment carts are used in nursing schools, hospitals, and doctor’s offices.